Getting ready for a ride on the trailer bike. As you may have guessed from the ratio of blog posts on restaurants versus sports and recreation, we are not the most athletic of families. 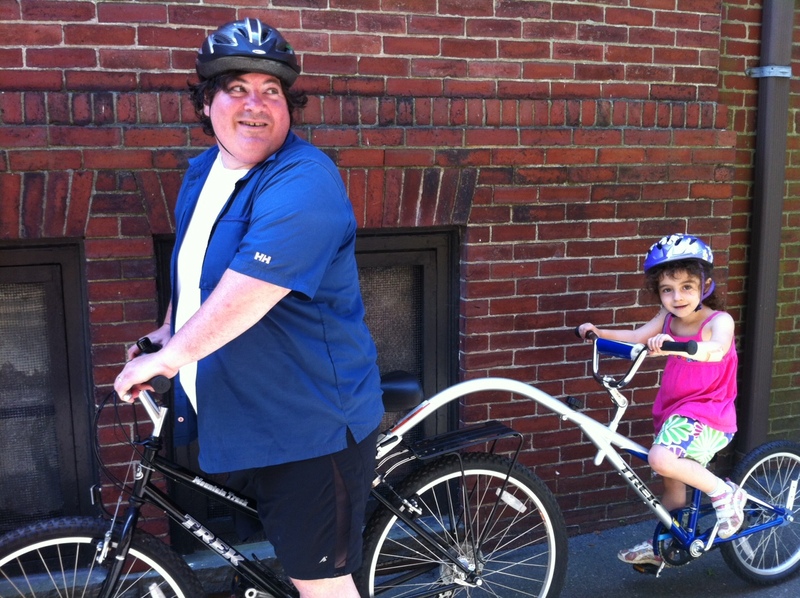 But inspired by a recent “bike to school” day, we decided to purchase a trailer bike, which enables our 5-year-old to feel like she’s riding a regular bike (and can even help peddle) but leaves the steering and the braking to the adult rider. Early Sunday morning, we loaded the bikes on the car rack, ate some oatmeal while wearing our helmets (I’m not kidding, although our 18-month-old Lucy refused to wear hers), and then drove to Warren to park the car and get on our bikes. Of course, you can bike fairly easily to the path from Providence, but we wanted to make our first family ride low-stress by starting directly on the path itself. There was just one small problem, and her name was Lucy. She screamed, kicked and swung her arms as Geoff attempted to get her into the baby seat on the back of his bike. I didn’t have any more luck than he when I tried, although as it turned out I had less sympathy. Determined to at least attempt a ride on the path, I wrestled her into the seat, got on Geoff’s bike, and rode around the parking lot — and incredibly, she quieted down. So we decided we would switch bikes for this ride — I’d ride Geoff’s and he’d ride mine. More screaming as we strapped on her helmet and locked down her feet, but again once we started riding, there was complete silence. 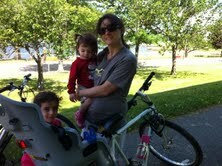 After our ride on the East Bay Bike Path.